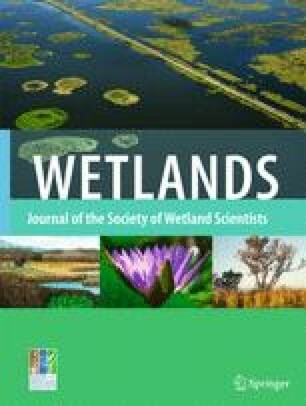 Short term nitrogen uptake dynamics in the marshes of the southern Everglades, USA, were determined through implementation of a field mesocosm and isotopic enrichment method. The approach was tested using six mesocosms, three enriched with a 300‰ 15N tracer, Ca(NO3)2 (± 98% 15N) and three unenriched mesocosms. This 15N tracer technique allowed the determination of nitrogen fluxes between key ecosystem components. The in situ mesocosm experiment was conducted in a freshwater marl prairie marsh habitat for a period of 21 days. Macrophytes (Cladium jamaicense), periphyton, soil, and consumers (Gambusia holbrooki) were sampled at prescribed intervals to determine the optimal sampling periods necessary to capture peak 15N tracer uptake. Over the course of the study period, 15N tracer was detected in all ecosystem components sampled except for soils. Periphyton exhibited the most rapid initial 15N tracer uptake, with an increase of 3.86‰ to 7.79‰ (± 1.70) only 5 minutes after tracer addition. Periphyton 15N signatures continued to increase to 16.49‰ (± 6.45) and 108.15‰ (± 49.40) after 10 minutes and 6 hours, respectively. Increased 15N signatures were also noted in the macrophyte and consumer components, with peak tracer uptake values occurring in aboveground macrophyte tissue at t = 9 day (26.62‰ (± 5.00)), the belowground macrophyte tissue at t = 15 day (22.01‰ (± 5.83)), and in consumers at t = 15 day (297.09‰ (± 127.36)). Tracer uptake by the soil component was minimal with no significant amount of tracer being detected in any of the three soil layers sampled (0–1, 1–5, and 5–10 cm). 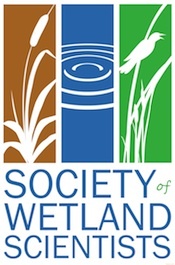 This testing of the in situ mesocosm and 15N isotopic enrichment approach provides a foundation for further experimentation with the method at this and other wetland study sites.